From full health profiles to simple tests, we make getting blood work done simple. We offer hundreds of different lab tests at affordable rates to make your corporate health fair or personal blood draw as informative as possible. Blood work is done during normal business hours by certified technicians. Tests are affordable, quick, and convenient. Whether you come in as an individual or experience your blood draw at a health fair, you’re sure to get quality service from the experienced staff at Cover-Tek. Get all the blood work you need in one convenient place. We’ve highlighted popular blood tests below, but are proud to offer hundreds more. Prices may vary based on location, event, and lab costs (which can fluctuate without warning). This profile provides a basic overview of several health functions. The Comprehensive Metabolic Panel (CMP) provides levels for kidney enzymes, electrolytes, liver function, cholesterol, triglycerides, blood sugar, calcium, and phosphorus. Complete Blood Count (CBC) tests for infections and anemias, and provides red and white blood cell counts. The male profile includes a Prostate Specific Antigen (PSA) test, while the female profile includes a thyroid test consisting of TSH, T4 free, T3 Uptake, and a T4 total. Includes assessment of triglycerides, cholesterol counts, and other indicators of heart disease. Highly recommended for men who are over 40 and those with a family history of prostate cancer. This test, also known as glycohemoglobin, gives a 90-day history of your average blood glucose levels. DHEA sulfate, progesterone, estradiol, luteinizing hormone, and follicle stimulating hormone (FSH). Analyzes functionality of vitamin D, which absorbs calcium and decreases the risk of cardiovascular disease. Anti-Streptolysin O Antibody (ASO), sedimentation rate, rheumatoid factor, and uric tests monitor Gout and Arthritis. Includes TSH, T4 Free, T4 total, and T3 uptake to aid in monitoring healthy thyroid function. Highly sensitive C-reactive protein test for an assessment of cardiovascular and peripheral vascular disease. At Cover-Tek, we can offer just about any blood test. Call us today for a full listing or if you have questions. We designed this specific lab profile for anyone on Accutane. Dermatologists require a monthly blood test to monitor your liver and to ensure that this powerful acne medicine is not having negative affects on your health. This test includes a Comprehensive Metabolic Panel (CMP), Hepatic Profile, a Lipid Panel, and a (CBC) Complete Blood Count. Females are also typically required to have a monthly pregnancy test, which we also offer. 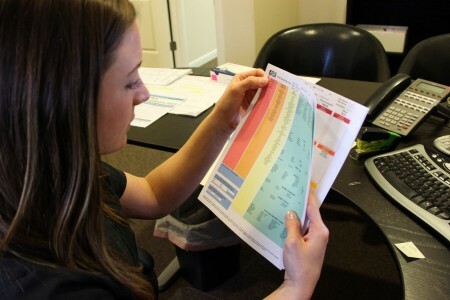 HCG Qualitative (Pregnancy Test, positive or negative) $33 HCG Quantitative (Pregnancy Test, determines how far along) $42. Many Americans have food allergies or intolerances and don’t even realize it. These issues could be the cause of symptoms like fatigue, bloating, and stomach pain. Identifying problem foods can be challenging but the proper test can help. We are proud to offer Food Allergy and Food Intolerance testing that can help you eliminate potential problem foods from your diet. This unobtrusive test satisfies legal requirements in a timely, confidential manner. All you need is your driver’s license and your child’s birth certificate and social security card.